As we come down the home stretch we are continually amazed by the multitude of professionals who have come and gone over the past 11 months, contributing their talents and great works to our project. We have met some interesting folks and have made some new friends along the way! I was inspired to present each of the key contributors with a token of thanks and being the crafty person that I am I was determined to make them something representative of the house. All summer I tossed around ideas but kept coming back to the pile of wall studs left from the demolition. John had his eye on most of it for reuse in the house but he let me have a few pieces and just before the winter holidays he cut it into smaller sections for me. I remembered that our son had handcrafted some wooden pieces when he was enrolled in a technology course at Pocahontas Middle School in Henrico County. Some were made as fund raisers and some as personal items including a beautiful writing pen. Deciding that we should give our principle contributors a pen and knowing that I could not make a pen myself, I reached out to the technology teacher to see if he and his kids would be up to the challenge. Wouldn’t you know it! PMS is involved in a year long fund raising project for Relay for Life. They are hosting the event on their track in June and had set some pretty lofty goals for themselves. Mr Long designed a win-win collaboration through which I would make a donation to Relay for Life for each pen completed by either himself or one of the students. In the end, I have 50 handmade pens crafted from century old wall studs and Relay for Life has a nice donation. I love it! 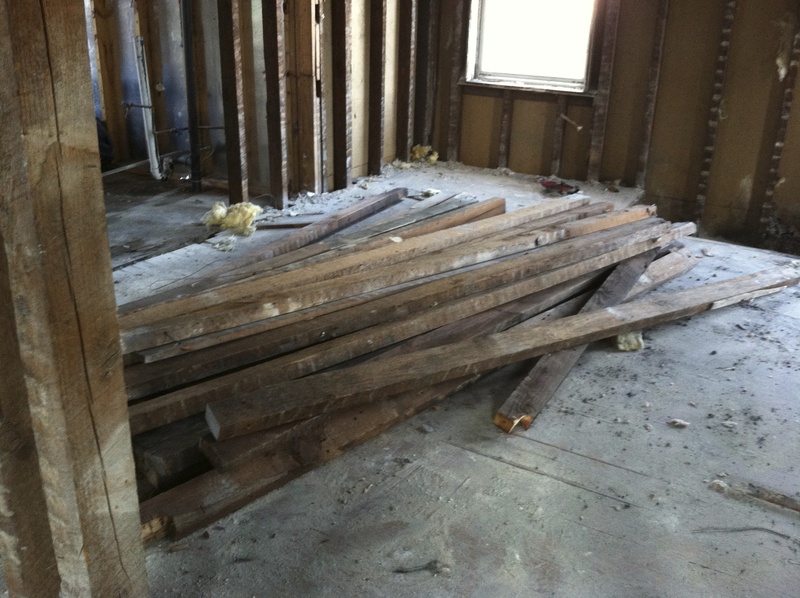 All the interior walls were taken down to open up the floor plan. Nails were removed and the wood was stacked for future use. I was able to sneak a warped piece for the pens. 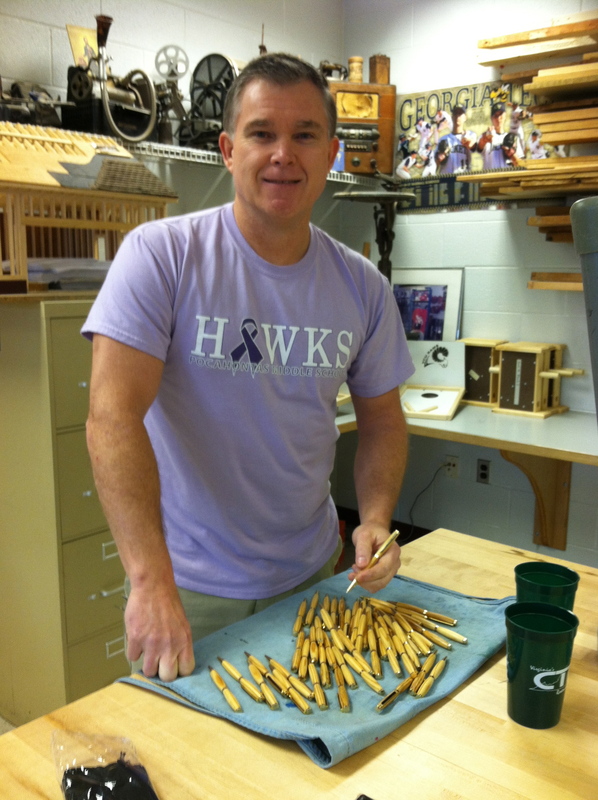 Coincidentally, Mr Long was wearing his purple Hawks Relay for Life T-shirt the day I picked up the pens! 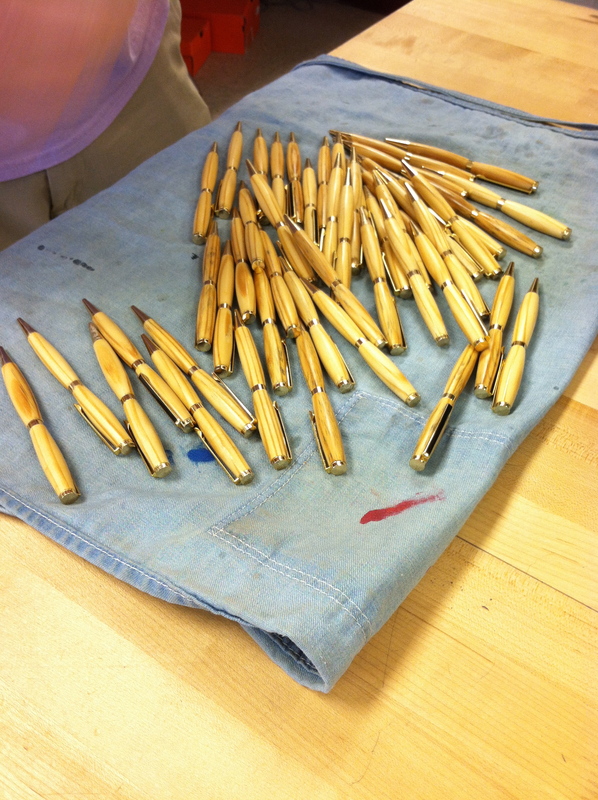 Our collection of pens made of Heartwood Pine taken from the walls of Honor’s Corner. Distribution of the pens began on the night we hosted Green Drinks and had many of the principles in attendance. Every now and then another stops by the house I can get one to them. Pretty soon we will have another gathering for the demolition crew that spent the hot summer months deconstructing Honor’s Corner and I can give them each a pen made from remnants of the wood they removed, reshaped and reused in our house. Certainly a small token of our appreciation to them and many others for their hard work. I treasure my pen and have been using it to write the many checks necessary to get us through these final weeks. That’s right! Final weeks.